Log on to the console with your Xbox Live gamertag. Go to Applications and select Browse applications. Select Clarovideo to download and install the application. When the download is complete, the application will automatically start and you can browse and view details about the available content. To start Clarovideo application later, go to video, My video applications and then select Clarovideo. The first time you launch the application, you are asked to sign. The display Welcome, enter your username and password Clarovideo. You can not access this application until you logged. If you do not have a subscription to Clarovideo, you can subscribe to clarovideo.com. Once logged in, you will not be prompted to log again unless you log in Clarovideo application on your console. Go to tv & movies, My video applications and then Clarovideo. From the hub of the catalog, you can view any of the featured programs listed at the center of the hub or explore a little further to see more content. Movies : to find new movies. Series : catch up on your favorite series. Children : find content for their children. Music : search for their favorite artists. Browse My Videos to search the contents of videos. Search your favorite programs on the hub Search. Select something to start playback. If you use Parental Controls to control which movies and TV shows can be viewed via Xbox Live, the application will Clarovideo those settings. For example, if you ban them look at the TV console with certain classification, such programs appear with an icon of "restricted video" on ClaroVideo application. To play a locked item, an adult must enter the access code Parental Control. For more information on how to restrict content via Xbox Live Parental Controls, see Parental Controls on your Xbox 360 console. 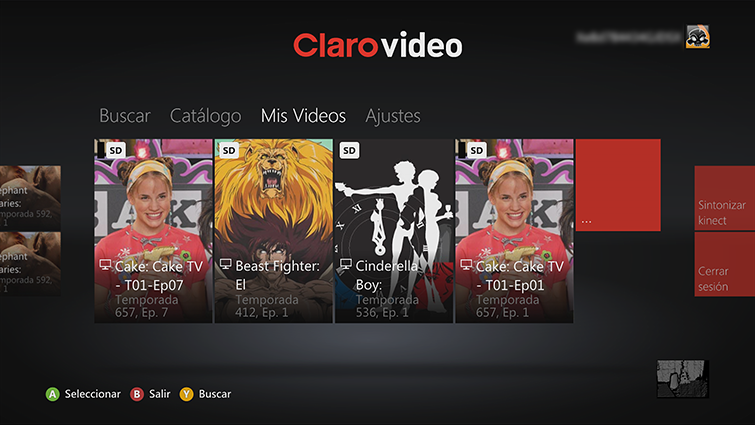 ¿Quieres contactar con el Soporte técnico con referencia al problema "Install and watch the Clarovideo app on Xbox 360" acerca del que estabas leyendo o con referencia a otro problema?